"America's First Name In Lift Gates"
All of Tommy Gate's Flatbed, Stake and Van Series liftgates feature application-specific features and enough options to help you put together the perfect liftgate package for your needs. 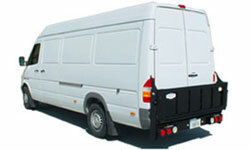 Cargo vans and Sprinter vans are also used as work trucks. For those applications that need a liftgate for lifting and lowering assistance, Tommy Gate offers two different models for cargo and Sprinter vans: the outside bolt-on Model 64P and 72P and the inside-mount Model 650. For applications that require both a dump-through tail gate and a liftgate, the Lift N Dump liftgate models offer the opportunity to have both in one package. Tommy Gate's Pickup Lift Series liftgates are specifically designed to fit today's popular models of full-size work pickup trucks (models are available for compact pickup trucks as well). For medium duty applications on flatbed, box van and stake bodies, Tommy Gate's Rail Gate liftgates offer a range of different platforms, models and configurations. From Treadplate Steel to Extruded Aluminum to the Gas Bottle Rack, there are many opportunities to configure a Rail Gate to meet your needs. Tommy Gate's Service/Utility Body Series liftgates are specifically designed to fit today's popular models of service or utility truck bodies.